Fortunately, I have only slept on a park bench once, the result of a poor decision to visit the world’s largest arts spectacle at a moment’s notice. Hotels, hostels, B&B’s and converted school dorms are booked out months in advance for a festival that features over two thousand artists from 28 countries, putting on nearly two hundred performances in just two weeks. Oh, and this doesn’t include the Fringe Festival, which runs alongside the main festival and is three times the size. 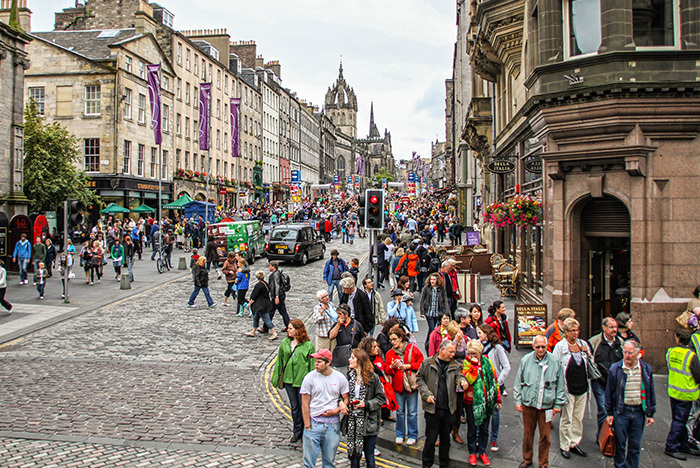 Over half a million people pour into Edinburgh, and it appeared almost all of them had prior reservations. Arriving on an atypically sunny day, I am swallowed by a crowd that never seems to dissipate. Fortunately I had met a group of student volunteers on the train from London who gave me free tickets to several shows, sending me in the direction of Princess Street. Picnic blankets litter the adjacent park, all the way to the rocky hill of the imposing Edinburgh Castle. Actors, or friends of actors, are dishing out handbills everywhere, urging the merits of their show as opposed to the hundreds of others competing for your attention. 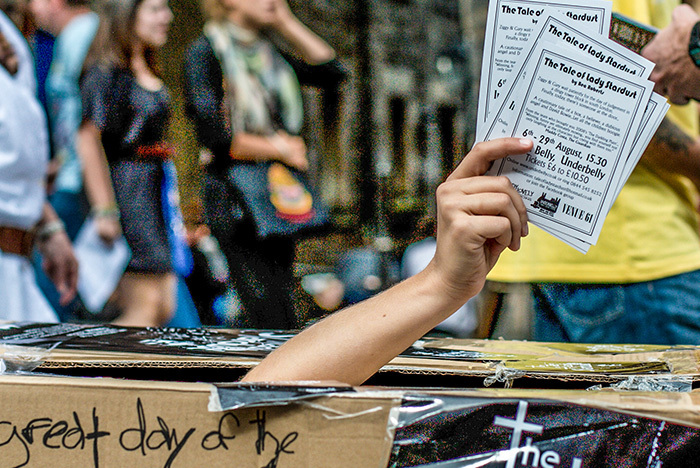 Due to the to sheer volume of handbills, they cover the streets like confetti. Bagpipes blast from authentic Braveheart-clad buskers complete with blue face-paint, safe from street vents a la Marilyn Monroe. I walk up (everything is up or down in the old city) to High Street, which is in itself one big theatre. 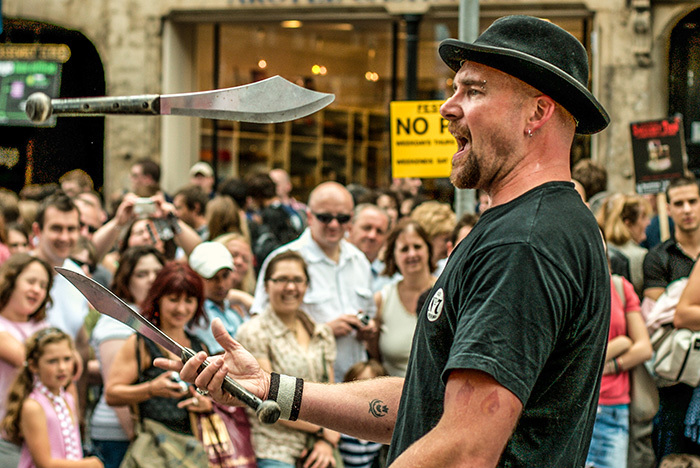 Every year, street buskers come from around the world to juggle, eat fire, or turn themselves into human kebabs. Mime, music, circus tricks – it’s an intoxicating cacophony of culture, only slightly tainted by promotional teams dispensing free products like cigarettes and tampons. After several unsuccessful attempts to secure lodging (one receptionist actually laughed at my planning ineptitude), I make my way to the old Film House to see a collection of the year’s best music videos. Some of the directors are in the room to speak about their work, and it is this opportunity to connect with creators that makes any arts festival so worthwhile. Everywhere I go, people are discussing some show or another, and thus word-of-mouth establishes the Festival’s must-sees. I buy a ticket to show whose name had come up a few times, and although critically acclaimed, it left me colder than the pint I followed it with. Walking back towards High Street, I bump into an old friend who is promoting an award-winning play, cheerfully giving me a pass to what became one of the highlights of the festival. If you bounce around like a pinball long enough, you’re bound to hit the bonus bell. With no place to stay and having seen a half dozen shows throughout the day, Edinburgh might seem like a penniless traveller’s dream. Especially when one can fortuitously bump into folks like the train volunteers I had met earlier, who offered a welcome wooden floor for the night. No complaints whatsoever, with the bonus of receiving an authentic Scottish welcome, meeting the locals, and all the other stuff guidebooks swear are essential for any legitimate travel experience. The next morning, my creaking bones catch a bus to the Modern Art Galley, which seems like a very cultural thing to do. A Surrealism Exhibition features dozens of masterful Magrittes, painting the perfect warped landscape for the rest of my day. By the time I get to Edinburgh castle, it is shrouded in mist. I explore the grounds, accidentally wandering into a play taking place in a closet, and soak up the history with a few drams of Scotch. Tickets to shows range from cheap to expensive, and for the most part, it seems that you get what you pay for. Still, talent has to start somewhere, and they can be encouraged that the homeless, the lost and the crazy will be there to support them. An accent can often bluff one into events – usually events that originate from wherever one’s accent originates. I found myself at a South African show featuring township jive mixed with techno. It all pays off with an invitation to the press bar, where members of the media gather late at night to discuss the day’s events, but mostly just to get drunk. A transvestite performer crashes the party, screaming about her show that everyone must attend. Security quickly escorts her out. By three in the morning, the bar has emptied and only then do I realize I have no idea how to find the volunteers who gave me a floor last night. It would have been smart to got a phone number, but thinking ahead never entered my Edinburgh equation. And thus I find myself at the other end of a policeman’s baton, shivering under a light drizzle, attempting to sleep on a concrete bench at the foot of a castle. Wet, broke, hungry and hung-over, but chock full of culture. My train was due to depart that evening, and despite the lack of sleep, I manage to catch a fantastic show by a troupe of French mimes, answering the age-old question: If you shoot a mime, do you use a silencer? The Festival itself was winding down, although offshoots like the Children’s Festival and Comedy Festival and Children’s Comedy Festival would continue for weeks to come. A Bucket List festival with something for everyone, Edinburgh’s cultural kilt brims with life. And should you wind up scunnered on a bonnie park bench, remember to keep ya heid.